One of the most difficult tasks for many seniors, especially those with arthritis, is getting up off of the couch or out of the recliner. These types of chairs can be difficult to get out of, because they are closer to the ground and most people sit in them for an extended period of time. There is also seldom a place to grab onto for support, so lift chairs are a very popular tool used to increase accessibility and prevent falls. Lift chairs are a type of recliner that allows the individual using it to control the entire chair electronically, including the backrest and footrest. There is a strong lifting system in the base of the lift recliner. This lifting system raises the chair, with its occupant, slowly up off the ground. Once the lift chair has risen completely, the seat is positioned at an angle that allows the occupant to safely exit the lift chair on their feet. There are three main types of lift chair, which are grouped based off of how far the lift chair reclines and the manner in which it does it. The Most common type is the three position lift chair. 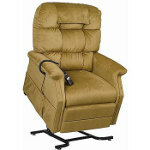 This type of lift chair reclines fully in the same manner as a traditional recliner. When the chair has been completely reclined, the backrest is nearly horizontal. This makes three position lift chairs very comfortable for sleeping in. The infinite position lift chair is also very popular and reclines a little bit farther than a three position lift chair. However, what really makes it different is how the backrest and footrest are operated. Infinite position lift chairs allows the backrest and footrest to be moved separately of one another. This ability makes them incredibly customizable, as you can recline the backrest without having to extend the footrest. Most infinite position lift chairs also have a button that allows them to operate exactly as a three position lift chair does. The other type of lift chair is the two position lift chair. Two Position lift chairs can only recline about 45 degrees, which is about half of the distance that the other types of lift chairs can recline to. These chairs are great for watching TV, but not so great for sleeping. The main advantage of a two position lift chair is its cost, as they are typically a little bit less than the other types of lift chairs. Does that Mean that Lift Chairs Only Recline to Two or Three Positions? No, it is important to note that all three types of lift chairs can be halted at any point up until they reach their limit. This means a two position lift chair can be reclined to more than just two positions and is only limited by how far the chair can recline. Unlike regular recliners, lift chairs are controlled electronically, so finding and keeping a comfortable position is much easier and can literally be done with the push of a button.